• Know that in some instances the people closest to you will not be happy with your new resolve. So what do you do? You remember what God has called you to do and move forward. While the plan that God has for your life will be met with resistance, the resistance will not be able to resist your divine purpose in God. 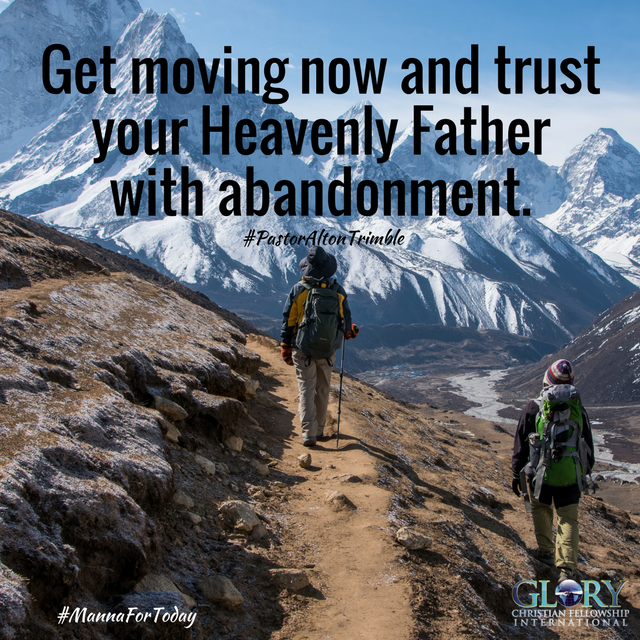 Get moving now and trust your Heavenly Father with abandonment. Heavenly Father, thank You for Your plan for my life. Help me to continually seek to know Your purpose for my life and grow in it so that I will continue to move forward according to your will and way. In the name of Jesus, Amen. In SPITE of the giants in my life…I am blessed to know I am loved and that God is mindful of me!!! Therefore, “I can do ALL things through Christ Who strengthens me”. Father God today and everyday we trust you in every area of ours life’s. in the mighty name of Jesus Thank you Pastor Trimble for the manna !!! Thank you Father that The manna this morning will pierce my heart. In Jesus name I thank you amen so it is! Father I thank you for all that you have done and are doing in my life. Holy Spirit continue to help me to move forward in the things that are up against me. I will go through with joy because in the end you will bring me out successfully in the Name of JESUS CHRIST, Amen.